Posted by tinpotrevolutionary in Anything for the weekend sir? Now I am a self-confessed tread-head, so when my good friends Sam and Rachel told me that they had bought me a tank driving day for my 30th last September I was over the moon! As they weren’t able to book it for the date in question, Sam had decided that we would go out for the day to Cosford RAF and Cold War museum. In my thirty years this is the closest thing I have ever had to a birthday party (Now put that violin away, I’m done with the woe is me diatribe!) 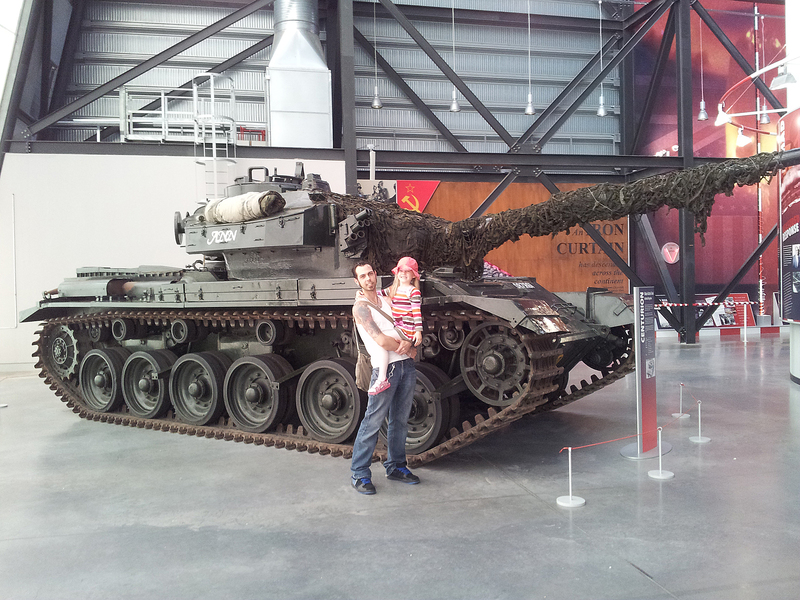 and so I spent a most enjoyable day with Sam and his daughters Phoebie and Amara walking around the plethora of tanks, planes and everything in between. I was certainly in my element, even though Phoebie insisted on me carrying her around the whole day (my bad back just isn’t up to that much punishment). Yesterday the date had finally arrived! I had to rise at the (for me) ungodly hour of 8am and was bundled into a car and driven to Doncaster, the site of the Unltimate Tracks tank driving experience. Having found the car park (situated in a copse of trees in the middle of the Yorkshire country side) we were loaded on the back of a military truck along with some other folks and made what can only be described as one of the most uncomfortable (though mercifully short) journeys of my life, to a farm-house down the road. After pushing my now loosened fillings back in, we de-bussed and went to sign in and get a cup of tea whilst we waited for our turn. 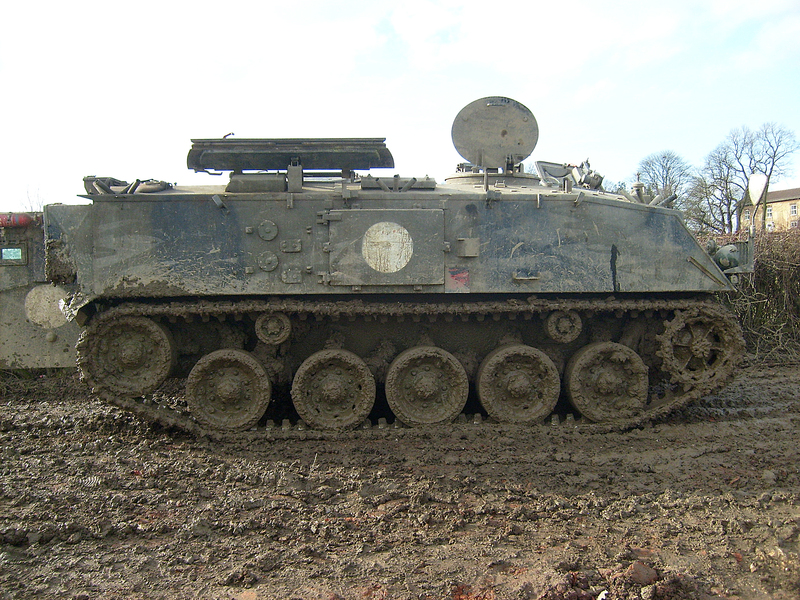 20 minutes later we clambered into the back of a FV 432 armoured personnel carrier and enjoyed a short ride to a rather churned up field to get behind the levers and have a go. Of the six people in the back of our APC, four would be having a crack at driving and I, quite sensibly, went last hoping to learn a thing or two before I was put in charge of driving a 15 ton armoured vehicle full of people!? As it turns out driving a tank is a piece of cake! A foot pedal to go forward and two brake levers to turn left or right! I roared off around the field for 10-15 minutes (though it only felt like mere seconds!!) and when we pulled up to a halt, everyone was still in one piece! I climbed out of the driving compartment with mud spatters all over my face and a grin from ear to ear. It was an amazing day and I have a flaming great bruise on my knee to remember it by (getting in to the drivers compartment was trickier than it looked!!?.. Honest… Sam even managed to sprain his wrist trying to get out!) I think you will agree that we can claim ourselves to be ‘proper’ tankies now! Our armoured steed for the day! To any fellow tread-heads out there, if you haven’t tried this yet I can thoroughly recommend it! It’s not only amazing fun in itself but the people who run it are very pleasant and make it a thoroughly enjoyable experience!